Refactoring existing code so that it improves and conforms to a design pattern can be a good thing. Your code will be easier to understand since it follows a known 'pattern'. Of course you have to need the change - your code will probably be uncomfortable to read and be crying out for clarification. This refactoring is about implementing a one to many relationship in your code more clearly by refactoring to the Composite design pattern. 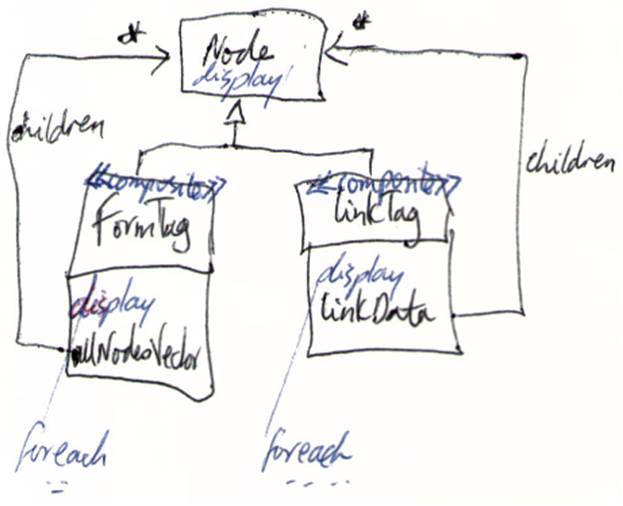 Here is the situation before and after the refactoring, in hand drawn UML. The child looping logic is duplicated twice - once in the FormTag class and again in the LinkTag class. And we all know that code duplication is evil and hard to maintain. By refactoring, we remove the code duplication to a common base class. 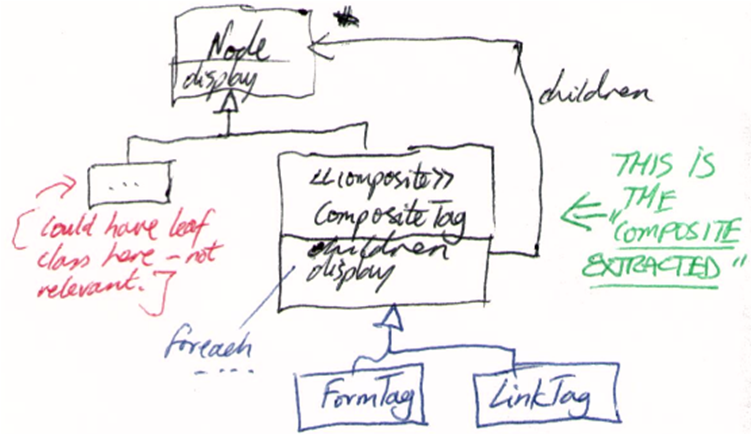 We use the "extract composite" refactoring to put the common looping behaviour in the display() method of a common composite class. We make the existing classes subclasses of this new composite class. Here is a python example of the above refactoring. Note that the display() method is actually called toPlainTextString() in this example. move & rename the child reference field UP to the composite using "Pull Up Field"
Move the method UP to the composite using "Pull Up Method"
Pull up any relevant constructor code too. Check interfaces so that client code using the old composites still works. Does the refactoring break anything? A proper refactoring means you don't break anything and everything behaves as before.